Cherelle Gunderson had so much fun representing Black River Falls this past year. During her farewell speech, she thanked the Black River Falls Downtown Association for sponsoring the Karner Blue Princess program. She thanked Emily and Chris Stewart for their hard work in being representatives for Karner Blue (they set up the parades and everything else), Deb and John Marg for making the sashes, and M&M Sports for making their signs. She also said in her farewell speech that her favorite memories was meeting Miss Wisconsin at Cranfest. During Cranfest she also had a broken ankle, however, she still attended every parade and event. At the end of each event or parade she would often get tired of walking with her crutches, so her dad would carry her back to her float. She also mentioned the 4th of July parade in Melrose. Cherelle and her first attendant Ava Gilberg were walking back to their float from meeting the new BRF Court and other Royalty when a baby bird literally fell at their feet and was hurt. So they picked it up and carried it until the parade started. They put it back on the ground in some grass near a tree. They were afraid it couldn’t fly because of how hard it fell, but once the parade started, the bird flew away into the tree it was near. They felt better after that, and they were happy they helped it out of the road and comforted it. Lastly, her most memorable moment was in Osseo at their parade. Cherelle and I were walking to the Queen’s Tea at the school, only to find out it was at least a mile walk. A parade official offered us a ride in her golf cart. While crossing HWY 53, the cart broke down in the middle of the intersection! We laughed but were also afraid of the traffic. We were able to get the cart to the side of the road, but had to wait about 20 minutes for someone to come get us and take us to tea. We made it to the tea with about 10 minutes to spare. Cherelle is very proud of herself, she is a very outgoing person and has a big heart. During her reign, she kept up her sports, education, and volunteer work. She was awarded the Presidential Education Excellence Award on May 1st, she had a 3.8 GPA within the first 3 quarters of the school year, and scored 85th percentile or higher in her math or reading in the STAR Math and STAR Reading assessment. She kept up her volunteering at the Jackson County Animal Shelter. She continued to play volleyball, county softball and traveling team softball leagues, traveling basketball league, and figure skating. She did more than requested for Karner Blue such as, attending the Gross Motors ground breaking ceremony, donating a birthday gift to Ilo – the BRF K9 dog, and other local events. 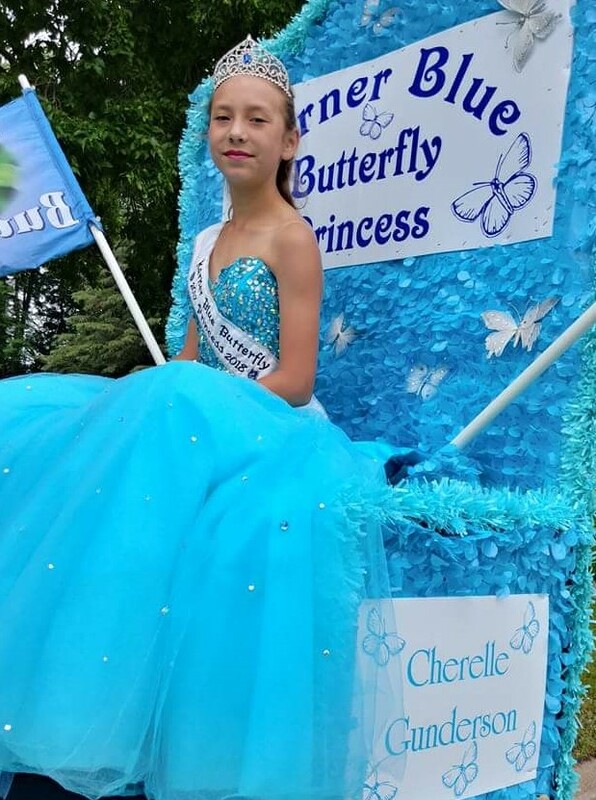 Cherelle did her duty and more during her time as Karner Blue Butterfly Princess. Cherelle mentions, she would like to give thanks the community for all of their support and encouragement this year. She had so many kids that liked to talk to her and take pictures with her. When she first ran for Karner Blue, there were 10 girls that ran. This year at the end of her year, there were 16! She loves how much the program is growing and wishes luck to Ashley Greengrass and Anna Phillips! Cherelle’s parents are Steven and Jackie Gunderson, maternal grandparents are Rodney and Barb Rave, and paternal grandparents are David and Teresa Gunderson.